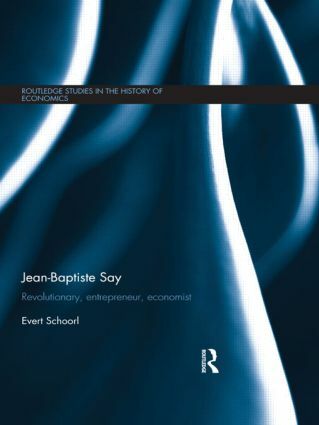 This volume is the first full-length biography of Jean-Baptiste Say (1767-1832), the most famous French classical economist. During his lifetime Say actively took part in three revolutions: the French Revolution, the Industrial Revolution and the establishment of economics as an academic discipline. He struggled with Bonaparte, was the owner of a cotton spinning mill, and published his famous Treatise of political economy and many other economic writings. "This is the kind of book that ought to make the history of economic thought an essential part in the education of any economist. It adds depth to what you think you know already, adds in much you may not have known before, and makes you think about economic theory in a different way, deepening your understanding of how economies work. 1. Youthful Revolutionary 2. At the Crossroads of Literature, Politics and Economics 3. A dissident under the consulate 4. Reluctant Entrepreneur 5. A rentier in a depressed economy 6. Spying in Britain 7. A dissident during the Restauration 8. Late Recognition 9. The Final Years 10. Among Masters, Peers and Students 11. Alive after 200 years. Evert Schoorl was director of graduate studies in the economics department at the University of Groningen, the Netherlands.